A thousand acres of raw land in Agua Dulce are moving closer to preservation as permanent open space. On Tuesday the Los Angeles County supervisors – acting as the board of the Los Angeles County Regional Park and Open Space District – will consider reauthorizing money to help bring 20 parcels under public ownership and control by the Santa Monica Mountains Conservancy. The parcels are available and there is a signed purchase agreement all ready to go, said county Parks Department spokeswoman Kaye Michelson. 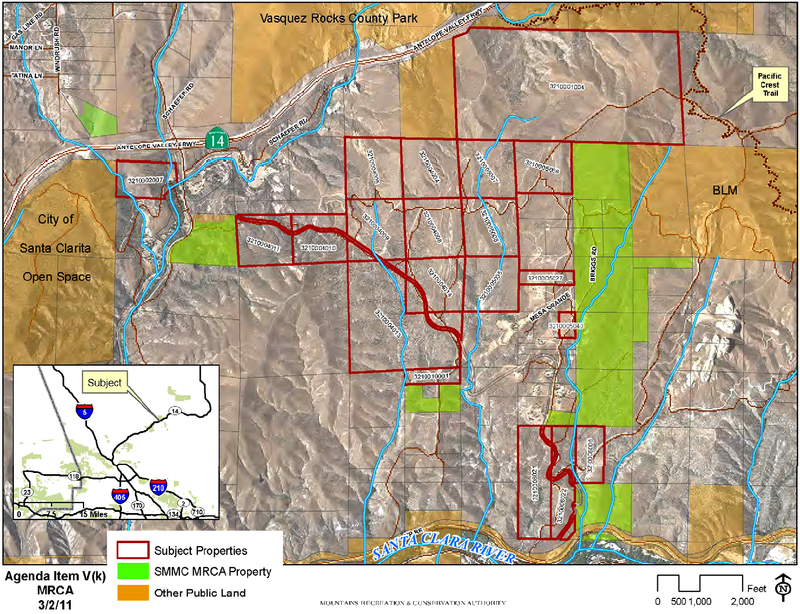 The parcels are roughly bounded on the west by the city of Santa Clarita’s easternmost open space (near the proposed Cemex mining site), on the north by Vasquez Rocks County Park and on the east by the Pacific Crest Trail. The total $4.47 million purchase price would be paid as follows: $2.47 million from the State Wildlife Conservation Board, $1.285 million (plus closing costs) from the city of Santa Clarita, and $741,955.47 from Los Angeles County. The $741,955.47 is what’s left over after previous allocations of park bond money from the county to the conservancy (via the Mountains Recreation and Conservation Authority). In June 2006, the supervisors allocated $300,000 to the MRCA to purchase certain tax-defaulted lands in the area described above, and they followed it up with an additional $1.02 million in March 2009. The MRCA bought a few of the tax-defaulted parcels but it wasn’t able to buy all of them because some of the property owners paid their taxes before the county tax collector could auction them off. Now the MRCA is asking the supervisors to roll the remaining $741,955.47 together into one grant and add the remaining 20 parcels to the Conservancy’s project list – a legality that must be dealt with before some of the money can be released. The county Planning Department determined the acquisition would be consistent with the One Valley, One Vision general plan, and the county Public Works Department gave the green light provided 10 feet of additional right-of-way and a slope easement are dedicated on one parcel that fronts Agua Dulce Canyon Road. The correct name of the PCT is Pacific Crest Trail. Often given the misnomer of pacific crest trail.